Digital Leadership: Leading successfully in the age of digital transformation. Part 1. This is the first in a series of x articles on the topic of Digital Leadership. I am Thomas Euler, a managing consultant at Eck Consulting Group, a Munich-based consultancy that specializes in digital transformation and digital business strategy. I am looking forward to condense my experiences into this series and am glad if you follow along! One final hint before we go into it: Please make sure you also check the notes/comments I left. I use them a lot, in a Grantland-footnote-style. For the last 8+ years I have been lucky enough to participate in many digital transformation projects. Some of them were pretty successful and generated tangible results for our clients, whereas others didn’t go quite that well. Over the course of time, my team and I identified a number of critical success factors for a company´s digital transformation efforts — ranging from the quality of execution and the deployment of necessary resources to the implementation of suitable organizational structures and processes, to name only a few. What do many of the most-often-cited digital-turnaround stories have in common? Correct. A strong buy-in and support from top-echelon management. Let’s take a look at some of the cases you will hear about on every conference that tackles digitization. For starters: Do you remember Dell Hell, the huge shitstorm Dell had to face after Jeff Jarvis criticized them publicly? It eventually resulted in many innovative, digital initiatives by Dell — for instance IdeaStorm, probably the best-known case of large-scale crowdsourcing, or the Social Media Listening Command Center, an almost revolutionary endeavor back in 2010. Or let’s take a look at the rejuvenation of SAP that — after initially missing out completely on ‘fads’ like SaaS or the cloud — eventually managed to get its game together. Today it has a nice portfolio of cloud solutions, platforms for external developers and something pretty closely resembling an agile development scheme. How did it all come together? Well, Hasso Plattner fired the CEO, replaced him with two Co-CEOs and personally addressed the most urging topics they had to tackle. Now that we have established a correlation between successful digital transformation efforts and a company’s top leaders taking an active role in them, let’s get to my aforementioned definition of Leadership. (Note that I subscribe to the idea that there’s a difference between a leader and a manager. An insightful notion introduced by Abraham Zaleznik in 1977). The list shows: Good leadership is of course partially based on know-how and intellectual capabilities — otherwise making smart decisions would be rather difficult — yet, there is also a huge collection of soft skills involved. To learn more about this topic I highly recommend this article by Daniel Goleman about the importance of emotional intelligence for effective leadership. Leadership isn’t physics, which means it’s not an exact science. There might be very successful leaders who are bad at two of those things. Or some people might be great at all three of them and still won’t make good leaders. However, in most cases one´s toolbox should include at least two of those skills on an above-average level in order to be a good leader. Keep these points in mind. 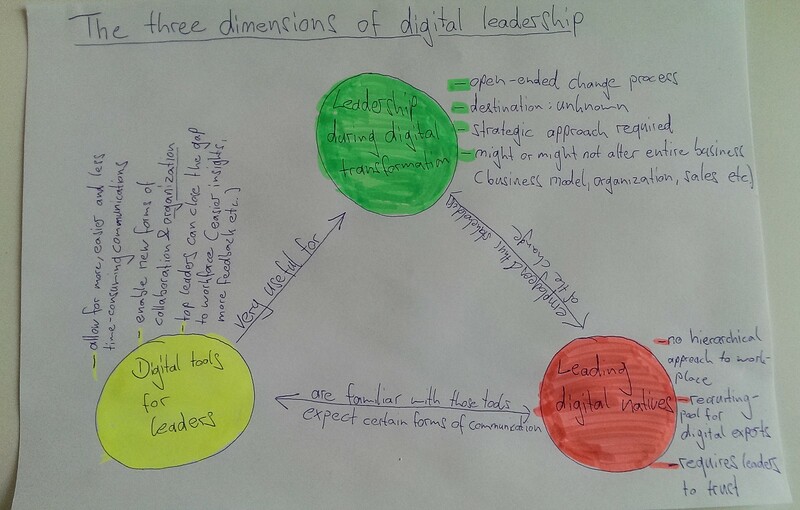 So, what’s digital leadership then? Based on this general understanding of leadership, I now want to get more specific and explain the concept of digital leadership. After all, that’s what my series of articles is going to be all about. The latter dimension is going to be at the center of this series, for it is the most complex and, in many cases, the most critical one. Plus, it is closely interrelated with the former two dimensions. Hence, even though I will focus on the third dimension of digital leadership, we will have a comprehensive understanding of all three of them by the time the series is completed. For now, I’ll give you a brief summary of each dimension’s context and meaning. In future parts of the series, I will elaborate in more detail. When easy-to-use digital communication tools became more and more commonplace, the culture of communication started to change as well. Some might argue ‘for the better’ others might say ‘for the worse’. Both statements likely have a true core, yet fail to acknowledge that technology itself is neutral. Whatever the outcome of its widespread adoption might be, it always depends on the individuals using it. Increasingly smarter information management solutions allow for quicker and easier access to business data. Thanks to mobile, this even works regardless of actual location. The fact that basically everything can be measured as soon as it is digital gives way to entirely new forms of decision-making: For instance a test-driven, trial-and-error culture of creative tinkering. Digital communication tools are way more personalized than most media before. People have profile pages and pictures, they can have low-threshold social interactions (think ‘likes’) and so on. All this allows leaders to create the impression of a closer, more personal relationship with their employees on a much bigger scale as otherwise possible. This point can’t be easily explained in a couple of bullet points and will be part of at least one separate article in this series. The basic idea is that digital solutions for collaboration, communication and knowledge management enable companies to create new approaches to their organization. Think of it this way: The traditional way of organizing work in functional departments and strict hierarchies simply resulted from the need to keep a company with hundreds or thousands of employees manageable. Up until twenty (or in some cases even ten) years ago — before computers and internet-access became commonplace at most office workplaces — there simply wasn’t a viable alternative. Then, the first IT revolution came along and companies started rethinking their business processes and digitized them (think ‘ERP’ ). Back then, software was still static, so they focused on digitizing processes that were very structured. Today’s more dynamic software is key to taking it a few steps further. It allows to alter the way all employees work, collaborate and organize themselves. This, in turn, changes how work can be structured and organized at all (and what you need managers for…). Digital natives are inevitably joining the workforce around the globe. Some people appear to be thinking that digital natives constitute an entirely new species which demands radically new approaches by leaders. The very same people tend to paint pretty dark scenarios for the future all companies that fail to buy their respective pseudo-scientific toolbox for leading digital natives™. I think that’s a bit of a stretch. Not all digital natives are created equal. There are people born in 1985 or later who don’t challenge authorities and who are not super-connected always-on heavy-users of all things internet (though this type of course exists). Thus, I highly doubt what some people propagate. Like, for instance, that a company will go broke because it fails to implement a fancy internal social network, which, in turn, disgusts its young employees to such a degree they quit their well-paid jobs. Those are horror stories aimed at either fearful or bored executives looking for a new project. Yet, as always, there is an element of truth even in those scenarios. Individual expression, doing things one cares for, or a high degree of flexibility are some of the young generation’s important values. Those favor a certain kind of company in the war-for-talent. Namely, one that provides a flexible, dynamic work experience (buzzwords: byod, nomad workers, agile projects etc. ), creates a high buy-in in its vision from all employees and gives credit where it’s due (i.e. every employee can shine, not only the respective managers). Whenever a person can choose from employers, this cultural factor can become decisive. In the context of digital transformation, culture becomes especially important because experienced people in this domain are rare and therefore, they can choose. That’s why great developers might even earn more than their respective managers (and rightfully so) and why many companies not called Google, Facebook or superrr-hip-strtuply struggle to hire those people even though they would pay top-dollar. What does it mean for leaders when they don’t understand what their employees are working on, but at the same time know it’s an important issue? How do you lead in such a scenario? What instruments do you need? How do you make decisions? For most companies this is a huge challenge which demands a lot from its leaders. It starts with awareness for the fact that digitization is an issue at all and the willingness to commit the necessary resources as well as to drive the change. And it doesn’t stop there. As I have already mentioned, this aspect is going to be the centerpiece of my series, because it is closely intertwined with the former two anyway (also, it’s one of the most critical issues for many businesses right now). Thus, I will explore it in way more detail over the course of the next few weeks. For now, if you didn’t tl;dr, we laid the ground for what is to come. This, in the future, will help us to use the term with more precision. Finally, we glimpsed into what the dimensions actually mean and which challenges each of them presents to leaders. In the next installment I will dive deeper into the topic of digital transformation and how it alters what’s required from leadership. I aim at publishing one article each week but don’t pin me down on it. If you are interested in this topic, I’m glad when you follow along. Also, I appreciate your feedback, your input and any hints to interesting articles on the issue! So, don’t hesitate to get in touch. Part 2 is now online. You can find it here.